West Lake Park is situated in southeastern Broward County, near Hollywood Beach occupying a three-mile strip of mangrove estuary and uplands. 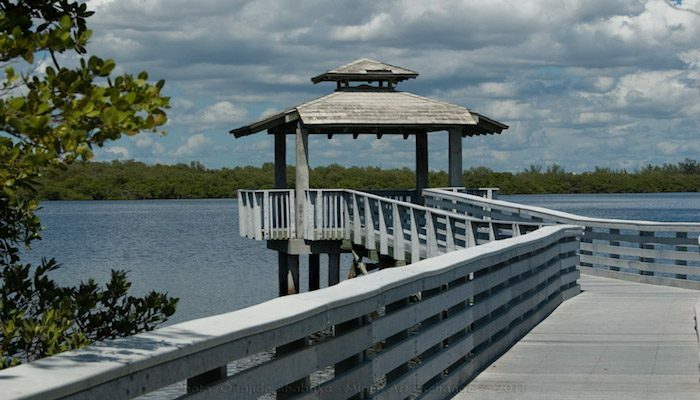 This 2.3-mile gravel trail, accessible from the north side of the park, meanders through mangroves and is popular with walkers and bicyclists. The loop is 1 mile, with additional distancew available. There are two gazebos, one with a great view of the Intracoastal Waterway. West Lake is home to more than 220 species of wildlife. Be on the lookout as you run along the trail! Add-On: Hollywood Beach Boardwalk route. 1.85 miles, take Sheridian St.
Visit the Anne Kolb Nature Center on the north side of Sheridan Street to continue your mangrove experience. Kayaking in the area!